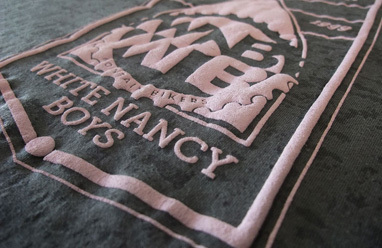 Our bespoke screen printing service is capable of rapidly producing large quantities of high quality printed clothing at discount prices; from screen printed t-shirts and printed hooded tops to high visibility workwear and personalised corporate wear. 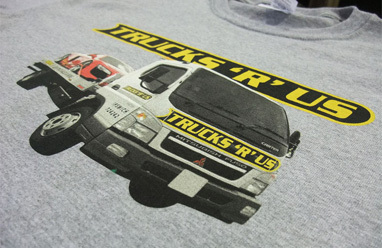 A4 Apparel can provide your company with customised printed clothing that's sourced from reputable brands such as Gildan and Fruit of the Loom and printed to your exact specifications. If you are looking for bulk t shirt printing or a cheap wholesale printing service that provides high quality printed garments delivered on time at a price that's right for you, contact us on 01271 816158 or get a competitive quick quote. If you require promotional clothing emblazoned with a corporate logo or are starting your own fashion label, we can print your design virtually anywhere on any item of clothing. 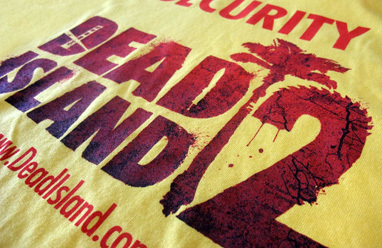 Typical areas to have your design printed include a large front print, a left chest print or a large back print. 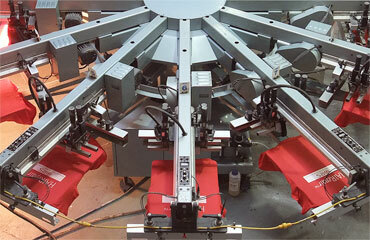 The most commonly used ink in the garment printing industry is Plastisol ink as it adheres to most fabrics. Plastisol bonds with the fabric fibres and has a rubbery feel that produces a long lasting vibrant print especially on dark coloured garments. Cannot be ironed over. 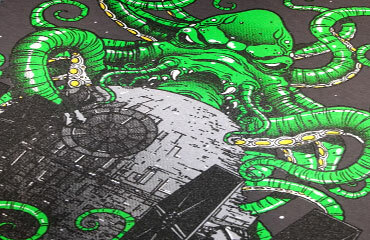 This type of ink is a good choice when a you want a soft feel to your printed garment. This type of ink dyes the fabric as opposed to 'sitting on top' of the fibres and can be ironed without smudging the print. 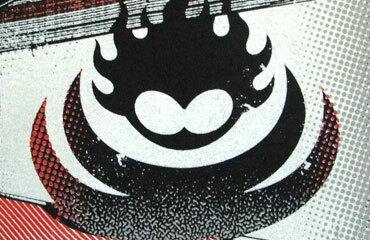 Using the discharge print method actually bleaches the dye from the garment before the inks are applied. 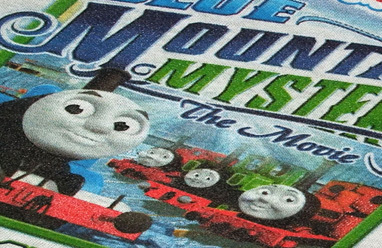 This results in a vibrant print but works best on 100% cotton. Certain dye colours react differently so please contact us for advise. If you require a full colour print or wish to replicate a photograph we use a method called 4 colour process This combines standard 4 colour process printing with spot colour printing. It can also be achieved by printing spot colours with half tone colours to create the image and is often used to print complex images. 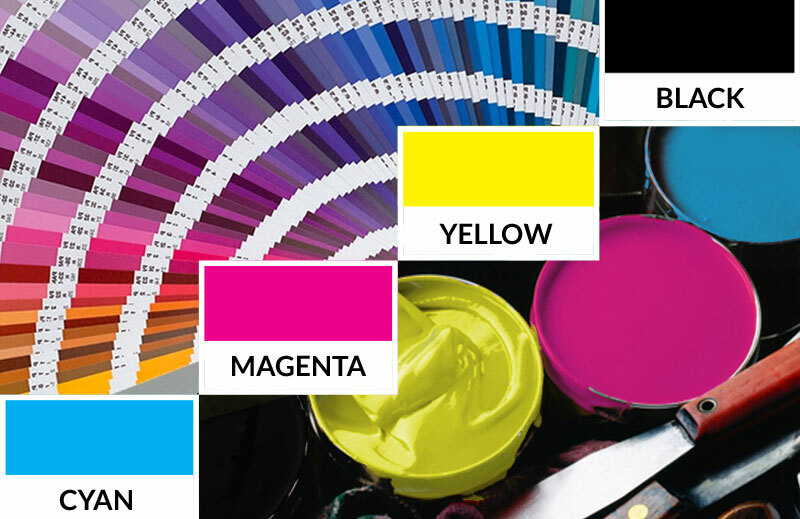 Index printing is suitable for both dark and light colour garments and produces great results when you have a design that contains 6 or more colours in a limited colour palette. 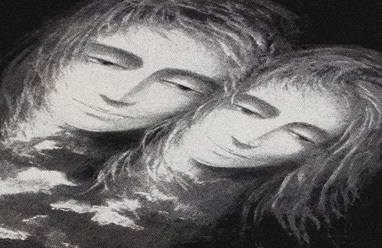 However it is not ideal for recreating a photo-realistic image and other methods are more suited to achieve this effect. These inks contain optically active pigments which hold the light then discharge it over time. Glow in the dark ink adds a vibrant look to your design but is not noticeable under natural light. The real effect becomes apparent under florescent lighting when your design comes to life. 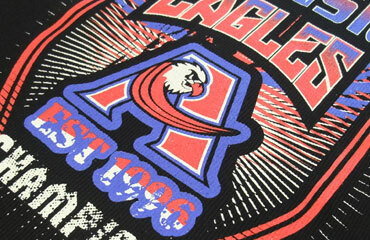 Puff printing is achieved by adding an additive to the ink and creates a raised 3D texture on the garment. 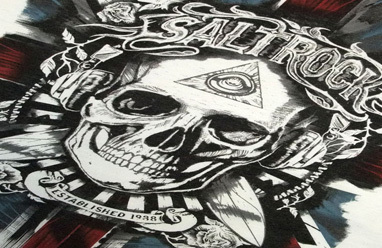 This can make a print really stand out and conveys a touch of luxury to the garment! In order to achieve the best possible results we require your artwork to be prepared in a suitable high resolution format. We accept artwork via email or on disc in the following formats: Adobe Illustrator file (AI), CorelDraw (CDR), EPS, JPEG, PDF, PNG, PSD or TIFF at 300dpi with all fonts outlined. These are the preferred formats so if artwork is provided correctly no artwork charges apply. If you have business cards or letterheads produced for your company the chances are your printers will have the logo in this format. Artwork saved as a Microsoft Word document or as a PowerPoint presentation or even supplied on paper will have to be re-drawn so artwork charges may apply. If you have an idea what size you'd like your design to be printed please let us now. We'll make sure that it's suitable or may advise an alternative size depending on the position of your print on the garment. As a rough guide please be aware that the maximum size we can print is 35cm x 48cm. 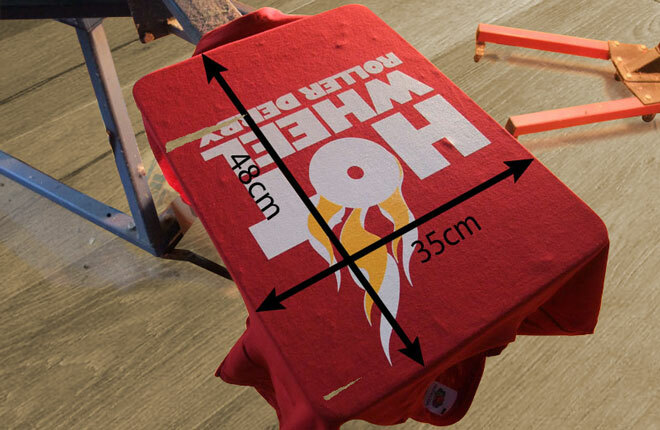 A standard size front print on a t-shirt is usually printed at 260mm wide, a left chest print is roughly 10cm square and a back print up to 32cm wide. 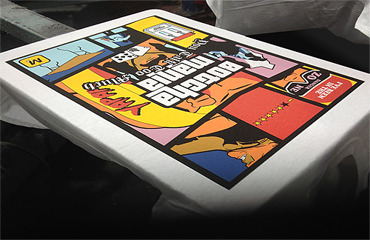 Screen printing is suitable for small and large designs and is only limited by the number of colours which can be printed. Currently we are able to print up to 12 spot colours and to replicate photographic prints onto clothing or designs that contain gradients we use a system called 4 colour process. The number of colours in your design will determine the cost of printing so refer to our print pricing guide for details. If you have a specific colour in mind or need to match your corporate identity please provide a Pantone reference number so we can match the colours exactly. We use the Pantone Solid Coated guide for colour matching. Once you have submitted your artwork we'll produce a digital mock up for you. This will be sent out via email for your approval before printing and give you a chance to review the layout of your design and the size it will be printed. Please note that our mock ups are used for illustration purposes only and provide a representation of the finished garment. To help you with your artwork submission we have created this set of pdf templates to download. You can import these into your chosen artwork package to assist you with your design. 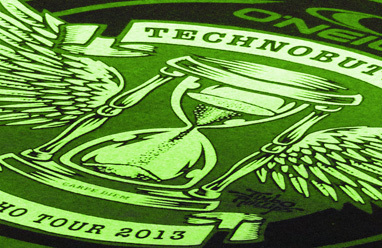 There is a one time set-up charge for screen printed garments. 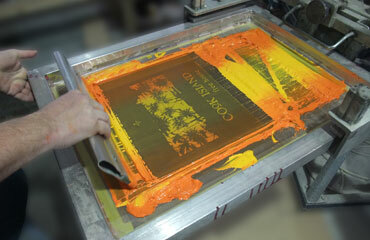 For each colour in your design a screen has to be produced to enable us to print it which are charged at £20 per colour. 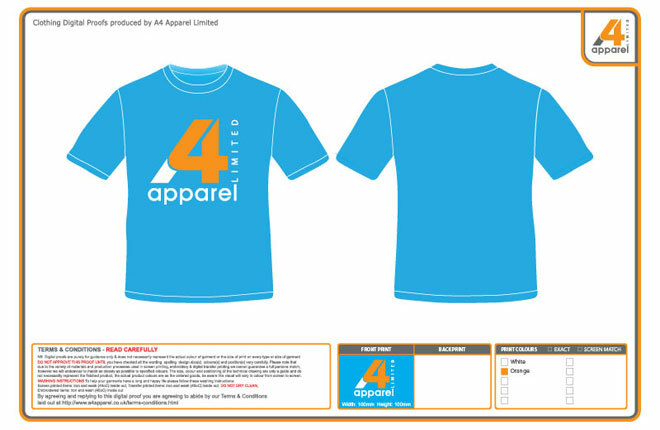 A4 Apparel do NOT charge any set-up costs on reorders. So if you needed more of the same design printed at a later date, these charges would not apply provided the dimensions and number of colours in the design remain a constant. In an effort to be as transparent as possible we have summarised all our print pricing for easy reference on each product page. Prices for screen printing are based on the quantity of garments you require and the number of colours in your design and are shown exclusive of VAT. Each individual blank (undecorated) garment has its own cost which you can refer to on the relevant product page. Once you have chosen your work wear or clothing, use the table on the product detail page to calculate the screen printing price to be added to the garment cost. NB All prices in the tables are based on purchasing your clothing from A4 Apparel. If you wish to supply your own clothing a 20% price increase will be added to all printing prices. Our minimum order is 10 garments.